Last night I digitized my hanko. 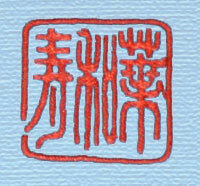 Hanko is a Japanese word for an object more commonly known in the West by its Chinese name, “chop”. Basically its a stone stamp carved with characters, known as kanji, representing the person’s name. Although there are now machine-made hanko available, a first-class hanko is always hand carved and is a very personal thing. Like a master calligrapher, the hanko carver may exaggerate the thickness or thinness of a stroke, elaborately straighten or curve it, or even deliberately deform an ideogram to create an artistic effect. While calligraphers may work with a variety of scripts, a hanko is most often carved in tensho script, a squarish blocky type of character that lends itself to stone carving more easily than the fluid curving lines one sees in brush writing. 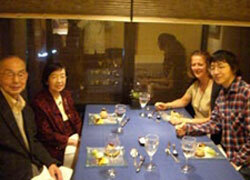 Foreigners usually write their names in simple phonetic symbols known as katakana. These are purely sound-based symbols with no “picture-meaning”. But for a birthday many years ago, my daughter-in-law gave me a kanji “spelling” for my name. Selecting kanji is a time-consuming process and my kanji is a gift that I constantly treasure. First a number of optional kanji choices with the desired phonetic are identified and then the picture meaning must be considered and when several kanji are combined the sounds and meanings often change, so that must be considered as well as the visual balance of the strokes in the final comination. There are even fortune-tellers who claim to predict your future based on the number of strokes in the kanji comprising your name and so, that can be another consideration. Reading my kanji from right to left, the sounds are PA-WA-SU for Powers, my family name, and the picture meanings are “green leaf”, “peace and friendship”, and “long life”. When my Japanese friends see my name written, they smile and say, “Oh, that so suits you!” I am afterall, still something of a flower child. After receiving my kanji I had a first-class hanko made and I’ve used it to sign my art for some 14 or 15 years now. Last night I made my hanko digital. 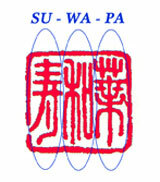 It took me a few hours, but I digitized a scan of my hanko so that I can now stitch it out as a computerized embroidery file. 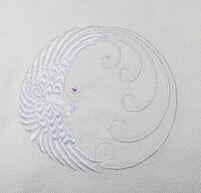 So now that I’m ready to embroider my name on my art, I really must get sewing so that I’ll have artwork to sign. This entry was posted in digitizing, Kyoto living on October 20, 2007 by admin. So with kimono fabric becoming ever more expensive and scarce, what kind of toys will I be left to play with? Some of the flea market vendors now cut up the kimono to sell in scraps and pieces, sometimes for more money than I used to pay for a whole kimono. 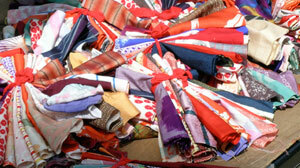 A truly choice scrap measuring just 6 or 10 inches square might be priced at $15 or $20, and sometimes even more. But all is not lost, since there is another treasure trove of opportunity in the ever expanding range of lovely reproduction fabrics being generated to please quilters, though fabric off the bolt doesn’t quite have that one-of-a-kind thrill you get from finding just the right kimono….. So my favorite new toy is learning to digitize in Embird Studio, with special thanks to Sadia Andrews for my start-up lessons at the American Embroidery Conference earlier this year. My first little effort, shown here on my jeans, was based on a carved jade butterfly belonging to one of my friends. I’ve made progress since then and althouth my skills may not yet be sophisticated enough to do full justice to the wealth of inspiration that surrounds me, I keep plugging away at it. Now, the effort is beginning to move beyond just making lemon-ade, and becoming a bit of fun in its own right. 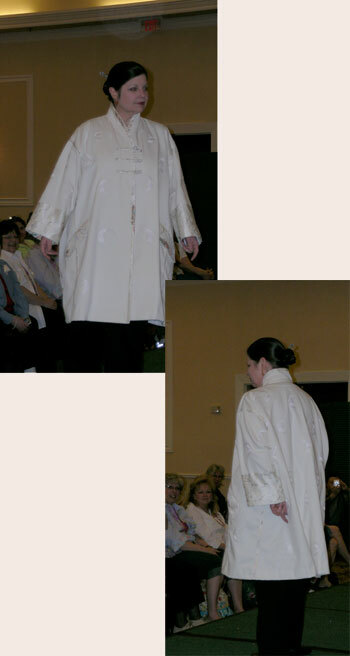 This entry was posted in digitizing, kimono on October 10, 2007 by admin.